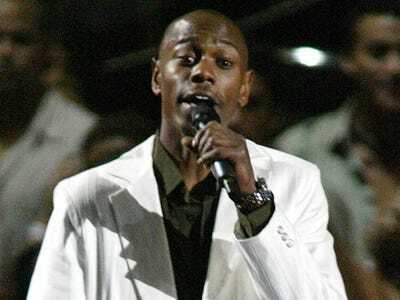 ReutersIn a new interview, Chappelle tells GQ he wants to guest-star on TV shows for a year. Dave Chappelle returned to the spotlight earlier this year when he performed sold-out shows at Radio City Music Hall for one week straight. 10 years ago, the comedian walked away from a hit series on Comedy Central and a reported $US50 million contract. During a stand-up routine in 2004, Chappelle told the audience the show was ruining his life. Since his return, fans have wondered whether the 41-year-old comedian is ready to make a comeback. In a new interview with GQ, Chappelle says he wouldn’t mind returning to television, but not with his own show. Instead, he has a “show-business bucket list” he’d like to accomplish. “I’d be a zombie in The Walking Dead. A corpse on CSI. I’d be the first black guy to f — Olivia Pope on Scandal,” says Chappelle. You can read the full GQ article here.